Sometimes, recipe inspiration strikes and I have to try something new right away. Like, as soon as humanly possible. That’s how I felt when I thought of making these Vegan Burrito Bowls in the Instant Pot. 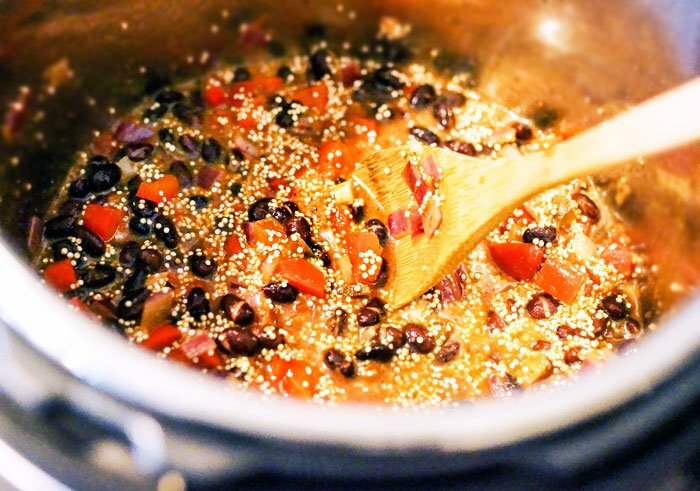 This recipe is actually a spin-off of a simpler idea I had last week– I wanted to make protein-rich “Mexican rice” by combining two simple ingredients: quinoa and prepared salsa. Genius, right? I thought so, anyway. We always have a jar of salsa in our pantry, so I thought it was a super-convenient way to add some flare to our usual quinoa, without taking extra time to chop up veggies. I replaced one cup of the cooking water with one cup of salsa, and it turned out really well. During that first test-run, I sautéed some peppers and onions, along with some black beans and seasonings, to serve over my Mexican-style Quinoa. The combination was delicious, but I wondered if I couldn’t streamline the process even more by cooking everything in the Instant Pot at the same time. That’s how these one-pot vegan burrito bowls were born. I experimented with “dump meals” quite a bit while writing my latest cookbook, so I can tell you from experience that you can make these burrito bowls by simply dumping everything into the Instant Pot and pressing a button. However, the flavor is never quite as good compared to when you take the extra 10 minutes to sauté the onions and peppers first. Either way works; it’s just something to keep in mind! This recipe is delicious when served hot or cold. I like to enjoy it warm right after making it, then I throw the rest in the fridge for quick lunches for several more days. I hope you’ll enjoy it just as much. 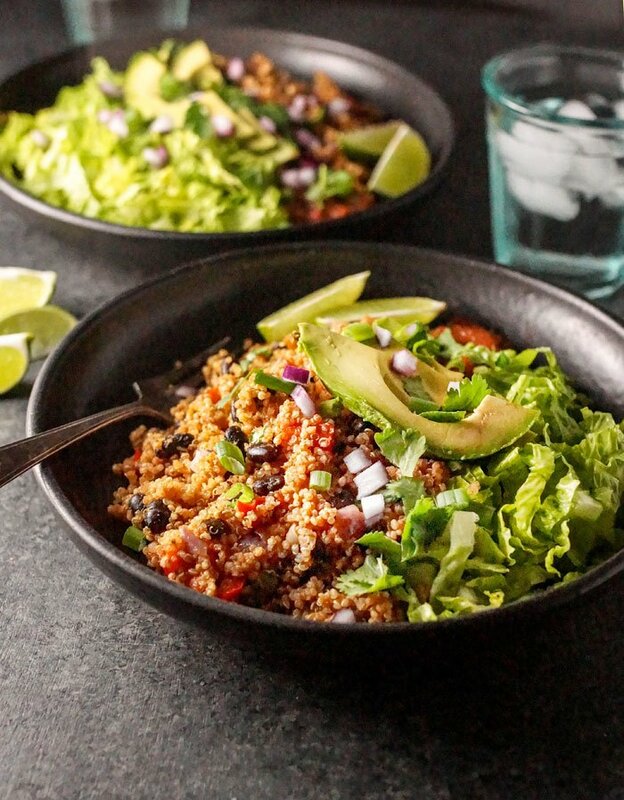 These Instant Pot Vegan Quinoa Burrito Bowls are an easy and healthy make-ahead meal loaded with fiber and protein. Heat the oil in the bottom of the Instant Pot, using the "saute" setting. Saute the onions and peppers until start to soften, about 5 to 8 minutes, then add in cumin and salt and saute another minute. Turn of the Instant Pot for a moment. Remove the lid, being careful to avoid any steam releasing from the pot, and fluff the quinoa with a fork. Serve warm, with any toppings you love, such as avocado, diced onions, salsa, and shredded lettuce. Leftovers can be stored in an airtight container in the fridge for up to a week. You can quickly reheat on the stove top, or serve cold! Note: Feel free to substitute another grain for the quinoa if you like, such as rice or millet. As written, this dish packs 14 grams of protein and 12 grams of fiber per serving! Stove Top Directions: You can heat everything in a covered pot over the stove. 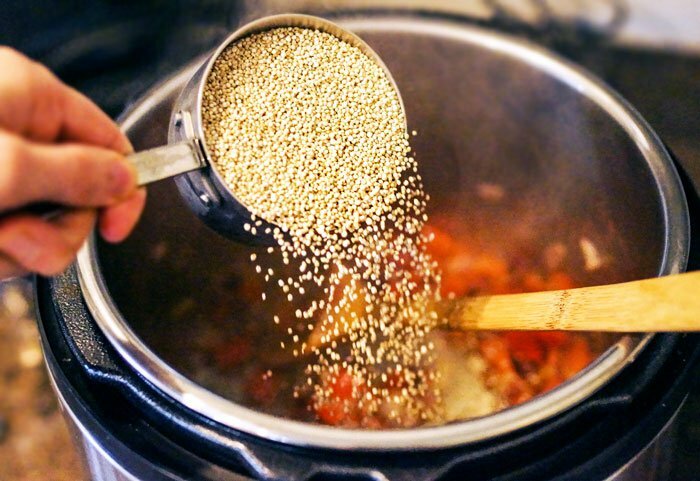 Instead of hitting the “rice” button using the directions above, simply bring everything to a boil in a large pot over high heat, then lower the heat and cover to steam until the quinoa is tender and the liquid is absorbed, about 15 minutes. Remove the lid and fluff with a fork before serving with your favorite toppings. This recipe is a great make-ahead meal to prepare over the weekend, so I hope you’ll try it the next time you have a free 20 minutes to spare. You can enjoy it right away when it’s warm, then have lunch ready-to-go for three more days next week. Reader Feedback: Do you have a favorite Instant Pot meal at the moment? Let me know what I should try next! I’ve almost perfected the best Vegan Mac n’ Cheese of my life using the Instant Pot… so that recipe will be coming to you soon. I just made this great recipe in my Instant pot. It was SO easy. I did add a few things to it…I did double the recipe to the letter and it was fine. I did add 1 tsp chili powder, I also pan seared some frozen corn and added at the and and a can of original Rotel. After the pressure cooking which I used the rice feature, it started to count down to cool and I let it go 12 minutes and checked the steam release and it was done. I would let it finish it’s cycle next time as the quinoa could have opened up a bit more. No change in taste just appearance. I mixed in fresh cilantro this morning to give it some needed green color and the taste is fantastic! I ate it with some wholly guacamole on top!! This is the first thing I made when I got my IP, and is one of my top 5 go-t recipes. The only advice I might have: If using a chunkier salsa, add the salsa last and don’t stir it in. I’ve had two batches hit the dreaded BURN message on my IP. If I pour the salsa in last and leave it on top of all of the other ingredients, I’ve never had a problem. I am having the BURN issue over and over too! Interesting, thank you for sharing that! I think this MAY mean that the salsa you are using has too high of a sugar content. I have never had an issue, but I have heard of this happening to friends when they make things that are sweeter. This was so delicious and so easy. Thank you for sharing, it will be added into my rotation! Full disclosure, as vegetarians the addition of sour cream and cheese made it even more delicious! Thanks for the great recipe! This is delicious! I used salsa from my favorite local restaurant and added shredded cheddar cheese on top. Even my husband loved it even though there is no meat. Yum!! This has become one of my favorite recipes. It’s great for potlucks or serving a larger crowd, I just double it. The calorie count has got to be off. One cup of quinoa yields 3-4 cups cooked. One cup per serving is way more than 163. 🙁 I wish! The recipe is great, however. Thanks for sharing. If I want to double the recipe do I need to add more time? No, you shouldn’t have to add more time, it will just take longer to come to pressure. Mushy! Followed the recipe exactly and find that while the flavor is OK, the texture is pretty much mush. 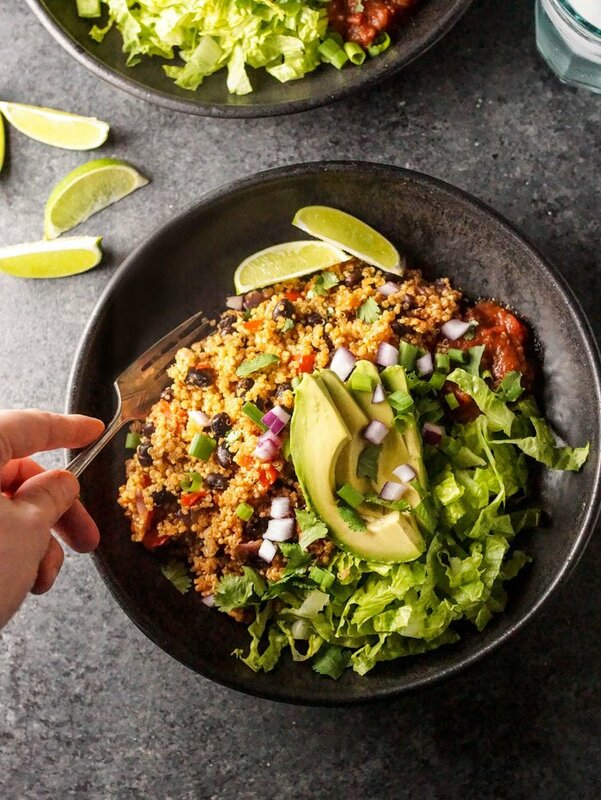 The Instant Pot Vegan Burrito bowl recipe is loaded with incredible flavor! I have to say this is one of the best tasting burrito bowls I’ve ever had! Everyone loved it! I love my instant pot and this recipe will become a regular in our household! Thanks so much! My husband said this was “incredible”. Thanks for the recipe! Btw 2 min on high and 15 minute NPR did not work for me (as another commenter suggested. The quinoa was not fully cooked.Next time I will follow the recipe! I made this as my first recipe for my new Instant Pot. What a hit! The flavor was amazing and I felt the avocado definitely took it to the next level. I might experiment with the liquid quantity because mine, probably due to the kind of salsa, was a little mushy the first day. So good though! This was such a yummy recipe. I just got a Cosori pot(very simular to Instant pot) and this is the first recipe I tried. I cook a lot and the flavor, texture and complexity was awesome. My new favorite way to make a burrito bowl.I added vegan sour cream, scallions, cilantro and avocado as garnish. Thanks so much! If I double the recipe, do I also double the water? Also, do I keep the same cook time for double the ingredients? Thanks!! Loved the recipe. Turned out very tasty. I was wondering how many grams of carb and fat is there per serving? Also the ingredients list 1 cup prepared salsa, does that mean store-bought salsa? If so, what brand did you use? Yes, I used Trader Joe’s brand, and sometimes I just use fresh pico de gallo from the fridge case in my grocery store. What size instant pot did you use to make this? Thanks! I make a similar “casserole” in the oven that has shredded sweet potatoes in it. If those were added here, do you think I would increase the amount of liquid? I don’t think cooking time would change by much. It sounds yummy as is, but it reminds me of that other dish and made me wonder. Very easy and delicious! Thank you for the recipe! Loved this recipe! if I double the ingredients in the IP, do I keep the cook time the same? Or would I actually reduce the cook time, since it takes longer for the pressure to build up? I made this tonight, it was very easy and tasty, thank you for the recipe. This is a great alternatIve to chicken or beef. I did not have black beans but used pinto beans instead. Very good. THIs was so great! I am new to pressure cooking and quinoa, but this was so great. FOLlowed thE recipe exactly and it turned out perfect. i made this recipe exactly as written except I added more spices, because I’m a southern New Mexico gal and i like things very flavorful, not necessarily heat! I used one of my favorite spice blends, Tia Rita’s red chile blend – salt free ( http://www.sweethots.com/product-category/tia-ritas-southwestern-foods/ ). I don’t work for the company, just love their products. It turned out perfect and actually tasted better the next day! It’s so great over some chopped romaine with some sliced avocado, yum. Would this freeze well? Thanks so much! I haven’t tried that myself, but I imagine that it would! (Beans and Quinoa both freeze well separately, so I think they’d be fine together, too.) I’d freeze individual portions for easy reheating, then thaw in the fridge overnight so you can heat it up in a skillet when you’re ready to serve again. It freezes really well! I make this monthly and freeze half! I got an instant pot recently and decided to use this recipe as a base (since I’m learning cooking times). I didn’t have salsa so I added a can of diced tomatoes and ingredients for a homemade taco seasoning recipe and some frozen sweet potatoes (I know..not properly combined..) We topped it with guacamole and loved it. What measurements would I use to double this recipe? I’m looking forward to serving it at a dinner party. Thanks for the recipe and the inspiration. I found these quite bland, but adding beef or sirloin have them just the taste that was missing. Is a rice/ slow cooker similar to instant pot? Excellent flavor! Love this easy-to-make great-tasting recipe that’s healthy too! Thank you! Loved this recipe! Mixed it with some lettuce and guac and it tasted like heaven! I bought the instant Pot and so excited to try your recipes. What kind of salsa did you use for this recipe? Or do you think tomato sauce (from a glass jar) would work too? Would love a recommendation! Thanks so much! If you have a Trader Joe’s near you, we really like their Double-Roasted Salsa. When I don’t have that on hand, I’ve also used fresh pico de gallo from our local grocery store’s refrigerated section. I’ve never tried it with tomato sauce, but it might be worth a shot! or will the crock pot work as well? Very good. I love how simple it is. This will for sure be in rotation for Sunday lunch prep. This is one of my favorites!! It’s so good! This was delicious! And so easy. Perfect for lunch or a quick supper. I don’t like cumin in large amounts so I subbed chili powder. So good. Thanks for the recipe! Have you tried freezing leftovers of this? Seems like it might freeze well. i made this the other night and used it to stuff poblano peppers for vegan chili rellenos, they were a big hit. This simple dish has a great flavor profile! The only thing i will do differently next time is add a little more water and increase the cook time so the quinoa can open up a little more, I cooked it on the stovetop. This was amazing! I used fire roasted salsa and it added a nice kick. Thanks for the tasty recipe! Thanks Megan! So I tried 2mins High pressure with 15-20mins NPR, and turned out amazing!!! I sprinkled some shaved cheddar cheese on top and it was so delicious. My toddler loved it too 🙂 Thank you so much for the recipe! Feel free to experiment and see how you like it! What a yummy dish! It is so easy to make and tastes fantastic. Thanks for adding the stovetop instructions, Megan! This recipe was amazing! So simple yet flavorful – even my non-vegetarian husband loved it. I’m planning on making it already for next week. Delicious! Had it for lunch today. Didn’t have salsa so substituted my own canned spaghetti sauce ? I’m curious why the cook time is 12 minutes in the Instant Pot at low pressure – usually (and based on other sources for timing) I find quinoa is done in 6 minutes at high pressure – does using low pressure double the time ? I’m also guessing it doesn’t overcook the already cooked beans but I’m curious about the timing as it seems long to me, but then again I rarely use low pressure as a setting or even the rice button for that matter. great question. I have a LUX so don’t have low pressure and was wondering how I could make it work. If you can only cook at high pressure, I would do 2 minutes on high and then let it naturally release the pressure for 15 minutes before taking off the lid. You have great ideas! I look forward to trying this soon. Thank you for what you do. This recipe looks great! I can’t wait to try it! And your new cookbook is AWESOME! Hey Megan, what if you don’t own an instant pot? Do you have a similar recipe for those of us who still have to cook on the stove, lol? Ha, sorry! I meant to add stove top directions at the end, but my baby distracted me last night. 😉 I just added them to the bottom of the post– hope you’ll enjoy it.